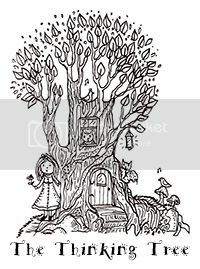 See Edit at the bottom of this post with regards to the Thinking Tree Learning Levels. As always, feel free to swap out the main curriculum journal with another as well as the spelling journal. Customize it, make it work for your unique family. When your books arrive you'll want to take your child to the library so he can check out at least 8 books to use with his journal. As part of his eight books ~you might have him find a few books to use with Travel Dreams journal as well. Pick a place to 'visit' then have fun learning all about the people there. Watch my 5-minute video walking you through each book! The Do-it-Yourself Journal is the 60 Day Plan Handbook. Your child will complete about 5-10 pages a day for 2-4 hours of fun learning. This journal has some Travel Dreams pages too but your child will choose where he wants to visit, so think about that as well when choosing books. If you'd like to take a peek inside this journal and see another very similar journal to this one but with a different cover you watch a video HERE. In the Do-it-Yourself curriculum, journal spelling is not completed every day. On the days your child doesn't complete a spelling page you can have him use the Spelling Time book or whichever spelling journal you have chosen for your child. Use Travel Dreams 2-3 times a week. Students in 5th-8th grade can study one city per month. High School students study one city per week to finish the course within a year. You can swap out Travel Dreams with Timeline of World History, Time Travel History, United States Handbook or the Seven Amazing Continents (not pictured). Math Genius can be used daily along with your current math program. If that is a bit much for your 10 or 11 year old than you can either take a few days off from your regular math and use Math Genius on those days, use Math Genius 2-3 a week along with your child's current math, or if it's summer and you are doing a lighter school load, use it then as your child's math for the summer with some fun math games (online or board games). My 14 and 15-year-old boys use it daily with their regular math program. My 11 and 12 yr. old boys will start Math Genius soon. I might have them do two days of Math Genius and three days of their regular math program. You can also forgo your regular math program while completing Math Genius. It's not a full math program per se but if your child struggling and/or dislikes math ~having him use Math Genius for a while can really boost his confidence & give him a break from 'regular' math while still 'doing' math. Have your child get lots of math in via games, shopping, putting together the household budget and so forth while using Math Genius. Math Genius is fun and non-stressful. It's a great way to take a few week off (or longer) if your child is really stressing out about math or struggling with it. Don't forget to allow your child to use a calculator. The whole idea is to show your child that they are a math genius. Dyslexia Games is not for dyslexic students only or children with learning challenges. I absolutely love Dyslexia Games because it uses logic, art, and creative thinking using and training the right side of the brain. This series of logic -right brain training is awesome! You can use Dyslexia Games as your child's temporary Language Arts program. Dyslexia Games helps with concentration, spelling, reading, and writing. This would be a nice break or change from your current Language Arts program. If you are not comfortable with stopping your current LA program that's fine too but try to start your day with Dyslexia Games. It's a great way to ease your child into "school" and gets the brain ready for the day. You can play classical music or other calming music. I wouldn't use this time to listen to an audiobook (but you can if you like) only because I think it's important for the child to put all their brain effort into the logic puzzles. In other words, keep their concentration on Dyslexia Games. If it's a doodle or coloring page, then an audio book is fine. I would just try to keep radios, audiobooks, and anything that will distract them when using non-coloring pages. That's just my opinion. With my children, I don't want their attention split between two things. At least not when using Dyslexia Games. These science journals were not available at the time we put this Starter Pack together. 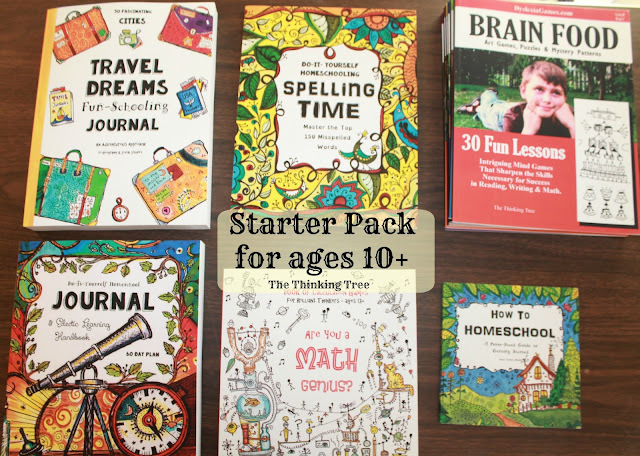 Pick a Science Journal to go along with your Starter Pack! Nature Study & Outdoor Science or the Science Handbook. Need help putting a Starter Pack together feel free to email me at homeschooling6(at)hotmail(dot)com. Please include if this will be for a boy or girl and the age of the child. EDITED: This post was written before the Thinking Tree Learning Levels were created. This is a Sarah approved Starter Pack. Keep in mind that you can swap journals out and many of the journals CAN be used for multiple ages/grades, you will adjust things to your child. Travel Dreams can be used with a 5th-grade student (10yr.) by scaling back to one city a month as written above. Check out lots of library books on that city, watch YouTube Videos, and make a meal etc. If Spelling Time is too advanced for your 11-year-old child than swap it out for Spelling Time B. 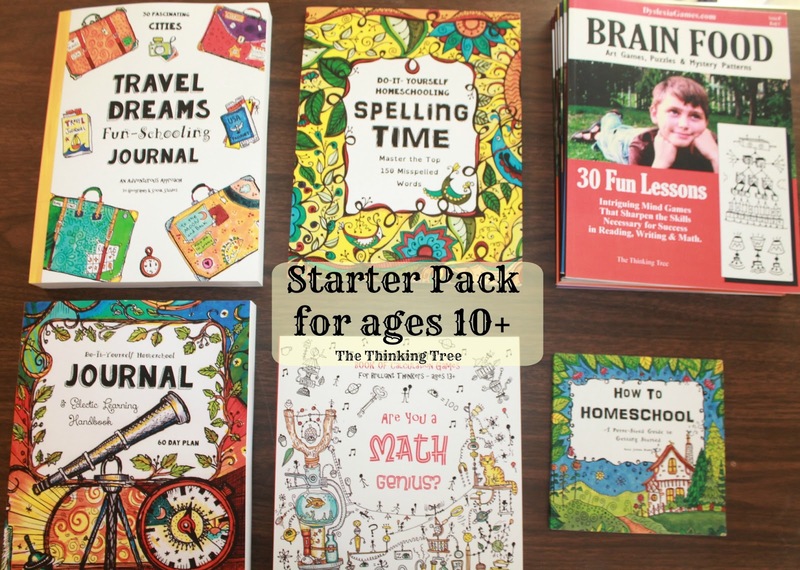 Read about the Starter Pack for Ages 5-9 too! See all Journals HERE.